Earlier today, I contacted Letitia King, Spokesperson for the Broadcasting Board of Governors (BBG). I asked her for details regarding the cuts to shortwave services that were recently announced. U.S. international media must optimize program delivery by market. We are ending some shortwave transmissions. We continue shortwave to those countries where these transmissions are still reaching significant audiences or where there are no reasonable alternative platforms at a lower cost to the BBG. The shortwave reductions will save U.S. taxpayers almost $1.6 million annually. There are no reductions in staff or programming – these are transmission platform reductions only. Programming continues to be available through other media. Shortwave transmissions continue in many languages including to key shortwave markets like North Korea, Nigeria, Somalia, Horn of Africa, and elsewhere. (List enclosed below). Transmissions also continue on other platforms including AM, FM, TV and online. SW is used by just 2% of adults weekly in Azerbaijan, and does not yield significant audiences for the service (0.4% weekly reach on radio in BBG’s most recent survey). By contrast, satellite dish ownership is widespread, at 56%, and 18% use the Internet weekly. The service has both satellite and online products, which are far more likely to reach audiences in Azerbaijan. SW is not widely used in Bangladesh (just 2% weekly), and the majority of the service’s audience comes to its programming via FM and TV affiliate networks in the country. Outside of sub-Saharan Africa, English speakers are rarely users of shortwave radio. They are more likely to be educated and affluent, and to have access to a broad range of media. Years of BBG research questions on consumption of VOA English on shortwave have failed to find any significant audiences outside Africa, in large part because usage of shortwave radio in other regions is mostly very low. SW is very little-used in Laos – less than 1% of adults report listening to SW radio weekly. In BBG’s most recent research in Laos, no surveyed listeners reported using the SW band to access VOA content. A strong majority (66%) hear VOA on FM, through affiliate stations on the Thai border that carry VOA content (Laos is so small that border FM stations have decent penetration into the country). BBG audience research indicates strong interest in learning English, but very limited shortwave listenership to VOA Learning English, outside a few select markets. The service is working more closely with other VOA language services to create English learning products for distribution on more popular channels. And Learning English offers a variety of digital products that are increasingly popular, including a Skype call-in show, videos on YouTube, and a website featuring both audio and transcripts for online audiences to follow as they listen. SW is not widely used in Uzbekistan (just 2% weekly), and does not yield significant audiences for the service (0.3% weekly). Adults in Uzbekistan are much more likely to own a satellite dish (13%) or use the internet (12% weekly) than to use SW, so the service provides content on those platforms. Uzbekistan is an especially difficult market to penetrate with USIM content, but SW is not an effective platform for the country. Continuing Distribution: SW on multiple frequencies for all 24 broadcast hours remains on, in addition to 24 hours daily MW; “Radio on TV” on VOA Persian stream; 24 hours daily satellite audio with slate plus 24 hour Audio on 4 other satellites including Hotbird, the most popular satellite in Iran; Multimedia website (with circumvention tools deployed); Social media; mobile app with anti-censorship proxy server capability built-in. This is only a reduction to the number of simultaneous frequencies during some of the broadcast day. SW radio, with 5% weekly use in 2012, is considerably less popular than other platforms on which audiences can access Farda content, such as MW (10% weekly use), satellite television (26% own a dish, and 33% watch satellite television weekly) or the internet (39% weekly use). SW is very little-used in Laos – less than 1% of adults report listening to SW radio weekly. RFA Lao’s listeners come overwhelmingly via FM stations on the Thai border – 94% of past-week listeners report hearing RFA on FM. (Laos is so small that border FM stations have decent penetration into the country). · SW radio is very little-used in Vietnam – less than 1% of adults report any weekly use of the waveband, and RFA reaches just 0.2% of adults weekly on radio. MW is slightly more popular, but the future for USIM in Vietnam is likely online: 26% of Vietnamese use the Internet weekly now (with much higher rates among certain populations, like the young and the well-educated), and three in four personally own a mobile phone. While Vietnam attempts to block access to sensitive sites, Vietnam is actually the most active country in our most popular Internet Anti-Censorship tools with almost 600 million hits per day. This entry was posted in Broadcasters, News, Shortwave Radio and tagged BBG Cuts, BBG Reductions Shortwave, Broadcasting Board of Governors, Radio Free Asia, Radio Free Europe, Radio Liberty, RFA, RFE, shortwave, Shortwave Cuts, VOA cuts, VOA Learning English, VOA shortwave, VOA Special English, Voice of America, Voice of America Cuts on June 30, 2014 by Thomas. “HR4490 contains the following amendment attached to the bill by Cong Lowenthal of CA. Cong Lowenthal has the largest Cambodian community in the US in his constituency as well as Vietnamese. This is the amendmentto HR4490 which was approved unanimously by the Committee on Foreign Affairs. Click here to read the full text of H.R. 4490. This entry was posted in Broadcasters, International Broadcasting, News, Shortwave Radio and tagged Amendment to HR 4490, BBG Cuts, Broadcasting Board of Governors, HR 4490, Radio Free Asia, Radio Free Europe, Radio Liberty, RFA, RFE, shortwave, Shortwave Cuts, VOA cuts, VOA Learning English, VOA shortwave, VOA Special English, Voice of America, Voice of America Cuts on June 28, 2014 by Thomas. 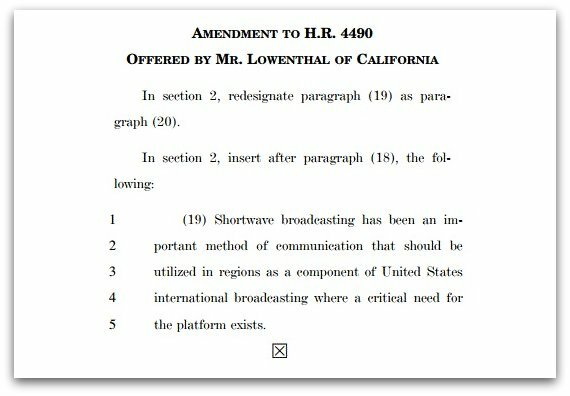 Unfortunate news from the Voice of America: Congress has approved major cuts to US international broadcasting over shortwave. Thanks to Dan Robinson for sharing this significant news. VOA to end shortwave broadcasts in English and several language services Monday. 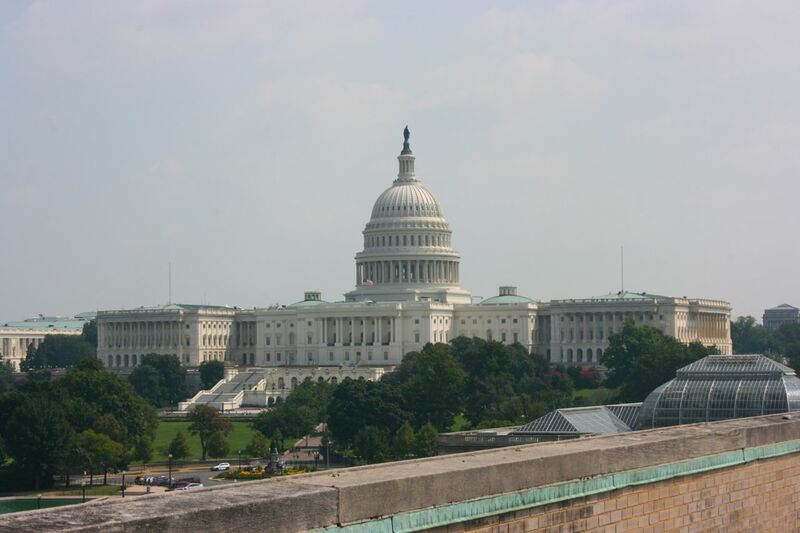 We were informed late Friday that BBG’s proposed shortwave cuts for FY2014 have been approved by Congress. As of the end of the day on Monday, June 30th, all shortwave frequencies for English News programs to Asia will be eliminated. We will no longer be heard via shortwave in the morning (12-16 utc), and the evening (22-02utc)…mostly in Asia. Shortwave frequencies for the following services will also be eliminated: Azerbaijani, Bangla, English (Learning), Khmer, Kurdish, Lao and Uzbek. Shortwave being used by services at RFE/RL and RFA are also being cut. Because shortwave has been a cheap and effective way to receive communications in countries with poor infrastructure or repressive regimes, it was a good way to deliver information. But broadcasting via shortwave is expensive, and its use by listeners has been on the decline for years. At the BBG, the cost vs. impact equation no longer favors broadcasts via this medium to most of the world. Important for us is that we will continue to be heard on shortwave frequencies during those hours we broadcast to Africa. Also, we know through our listener surveys that about half of our audience in Asia and the rest of the world listens to us via the web and podcast – so all is not lost. This entry was posted in Broadcasters, International Broadcasting, News, Shortwave Radio and tagged BBG Cuts, Broadcasting Board of Governors, Radio Free Asia, Radio Free Europe, Radio Liberty, RFA, RFE, shortwave, Shortwave Cuts, VOA cuts, VOA Learning English, VOA shortwave, VOA Special English, Voice of America, Voice of America Cuts on June 27, 2014 by Thomas.